I worked with Max Moswitzer and Margarete Jahrmann on their nybble-engine-toolZ for the "artist in residence" project at V2_. The work is a multi user environment that visualizes the network processes evoked by the users and bots in the environment. nybble-engine-toolZ is a part of the larger Nybble Engine project. To see the toolZ in action go see this explanatory movie. The multi user environment is driven by the Unreal Tournament Game Engine so most of the interactive elements are in a game like fashion. 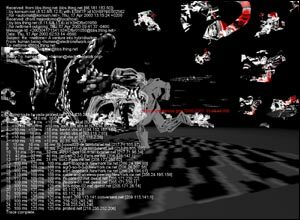 A user could perform a traceroute to another user, by shooting him. As soon as the traceroute 'bullet smoke' would hit a wall, an nslookup would be triggered. There was another weapon with which one could send emails asking for peace to the white house, and every now and than an incoming mail would be displayed on the HUD. For this project I had to dive into the Unreal Tounament Game Engine and learn UScript (Unreal Script). In order to provide functionality that the game engine doesn't support, I had to learn about writing native functions in C++. Unreals possibility to write native functions is very powerful! It allows you to write your own libraries of code. Not only can you call functions from this library in UScript, but library functions can call UScript functions as well. This functionality enabled us to run the external networking programs. 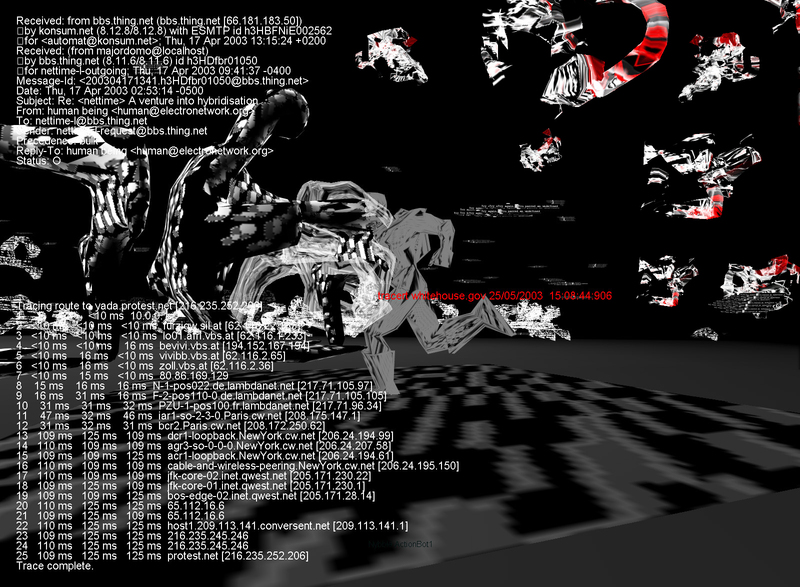 nybble-engine-toolZ could be played by users from their homes, but was meant to run as an installation. 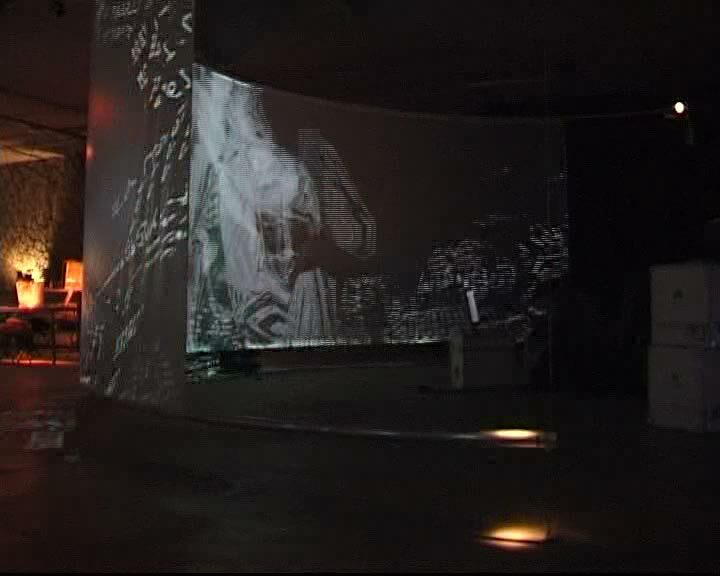 During the DEAF03 festival a huge 180° panorama screen was setup at the exhibition in Las Palmas. 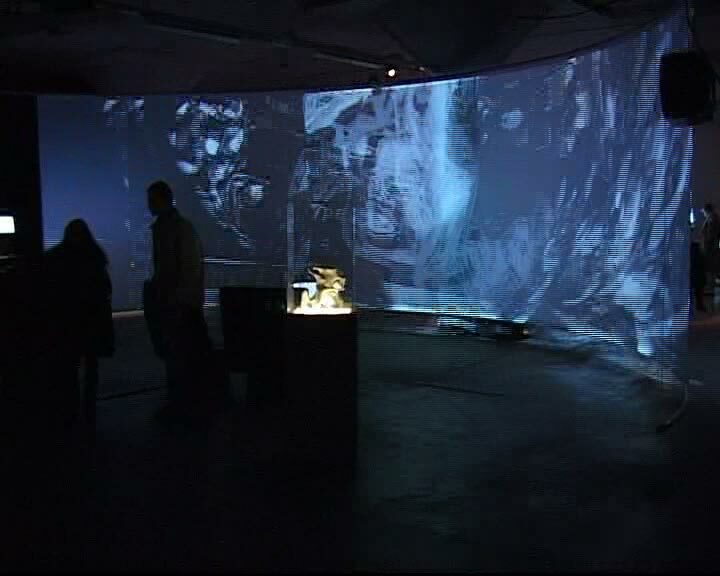 On this screen the environment was projected in spectator mode, so visitors could lean back on a sofa, and watch the output of network processes flying by. Across the river there were two computers installed at the gallery "Mama", where visitors could play the "game". To me the game engine part of the project was the most interesting. Both technically and conceptually. Technically it allowed me to learn a lot about Unreals networking. The system for prediction and replication is absolutely fascinating! Conceptually the combination of a network application and a game engine sounds like a lot of fun. When their residency started I asked Max and Margarete to explain the project to me in maximum 5 lines. After some thought Margarete told me she wanted to configure a network by playing a game. Well... nybble-engine-toolZ doesn't let you configure a network, but it did trigger the imagination! Screenshot showing a traceroute and incoming mail The visualization of the network environment was interesting as well. Max was fascinated by everything that takes place in a network and on a computer. He wanted to show exactly those processes that are normally kept invisible to the user. What happens when you send an email? What is all that stuff in the header? To visualize this in a 3D first person shooter environment had some very funny effects. After firing a traceroute, you had to run after the 'smoke' to see the final ip address. Especially with the immersive effect of the panorama screen you could imagine a sysop walking around in his network, to see if anyone is trying to penetrate the firewall. nybble-engine-toolZ was given an "Award of Distinction" by the Prix Ars Electronica of 2003.